Wet and dry part separated Bridge Pendant applicable to the hospital ICU ward, is the ICU necessary medical rescue aids, composed by bridge, dry and wet sections which is characterized by a reasonable wet and dry section separated structure, wet section configure flexible IV pole, dry section equips with instrument platform which height can be adjusted, in the wet and dry areas were equipped with oxygen, air, attract, power, network input terminal, infusion pump frame. Dry and wet areas using cantilever structure, improve the treatment space, rotating part use brake brake with anti-drift. The middle of the bridge is equipped with rotary lift treatment lamp. The main material is made of high strength special aluminum alloy and stainless steel. The surface treatment adopts imported raw materials, high voltage electrostatic spray, anti-ultraviolet and ozone. 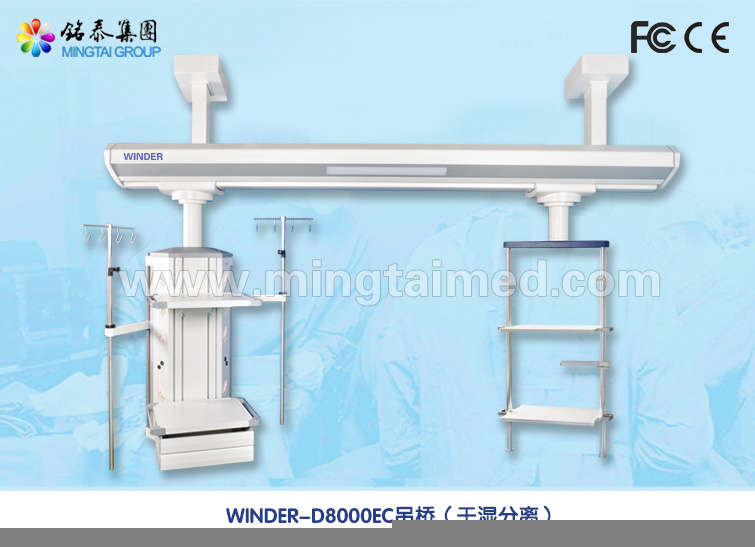 Providing a lighting solution for clinical treatment, various of system also can be choose according to hospital`s requirement. Looking for ideal Separate Wet Dry Bridge Pendant Manufacturer & supplier ? We have a wide selection at great prices to help you get creative. All the Separate Wet Dry Hospital Bridge Pendant are quality guaranteed. We are China Origin Factory of Separate Wet Dry Hospital Pendant. If you have any question, please feel free to contact us.